Spice in Zurich, Switzerland deliciously lives up to its name. Chef Felix Eppisser cooks Pan-Asian cuisine at the highly regarded restaurant, Spice, which opened in 2004, and has a one-star Michelin rating and 16 points GaultMillau. Located high on a hilltop, the stylish restaurant features walls of windows framed with red wood trim offering Spice guests a spectacular view of Zurich. 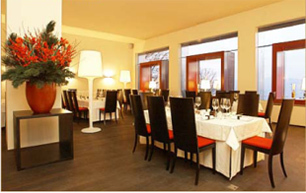 The high-ceilinged restaurant has a contemporary elegance with high back wood chairs with lipstick red cushions, square art glass plates, tall wine glasses, candles in votive holders, and autumn floral arrangements in rectangular wood dishes with gourds, chili peppers, and green chestnuts accessorize the tables draped with floor-length white tablecloths. Tall creamy floor lamps and sconces on the walls softly illuminate the wood-floor restaurant. Edward F. Nesta and I had dinner at Spice in October 2006 with our friend Oliver Guggisberg, who introduced us to this Zurich restaurant-find. Spice is all about attention to the smallest detail expertly managed by Felix's wife, Lucia, who is a gracious host that complements the Chef's strive for culinary perfection. 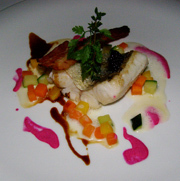 The restaurant features two menus, Aurum and Spice which change monthly. Edward selected the five-course Spice menu, Oliver selected the classic five-course Aurum menu, and I decided to experience both of the menus, by selecting items from each of the menus. We began our evening with aperitifs of Philipponnat champagne paired with the Amuse Bouche of salmon and sliced turbot with herbs, presented as salmon and turbot on crisp bread topped with a feathery crown of herbs and sprouts with a decorative sauce arc on the plate. As we waited for our courses to arrive, Anna, our server, brought us two small rectangular bowls filled with a selection of salted and unsalted butter rectangles to accompany the tantalizing bowl of miniature rolls and pretzels still warm from the oven. For his first course, Edward had Tandoori-Riesencrevetten mit Crab-Meet-Gemüsesalat an Ingwer-Vinaigrette und Massamam-Curry-Mayonnaise, which was Tandoori prawns with arugula and mesclun salad in a ginger vinaigrette and Masam curry mayonnaise presented in a small bowl set on a square banana leaf. Oliver began with the Trio vom Fasanen und Gänsbrüstchen, Nüssli-Rucolasalat mit geräucherten Gänsebruststreifen an Apfelbalsamessig 1990, Fasanenpfefferli mit Filoteigrolle und Wachtelei, Kleine Fasanengalantine im Sauternesgelée auf knuspriger Apfel-Tarte-Tatin. This course consisted of a trio of pheasant and goose breast, with a nut and arugula salad with smoked goose with a 1990 apple balsamic, and pheasant and pepper with quail egg, and a small round disk of pheasant gelatin in sauterne jelly on a crunchy apple tarte tatin. 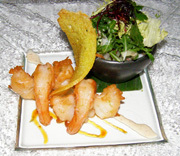 My first course was from the Spice menu, the luscious Tandoori prawns with crab and vegetable salad with ginger vinaigrette and Masam curry mayonnaise, which I enjoyed immensely. For Edward's second course, he continued with Asiatisch inspirierte Bouillabaisse mit Jakobsmuschel, Sepia, Zitronengras und Chilisauce, an Asian inspired Bouillabaisse made with scallops, squid and squid tentacles, julienne carrots, lemongrass, zucchini, and diced tomatoes, chili sauce, and garnished with a thyme spear. Oliver had Tapas von weissem Trüffel, Hausemachte Ravioli mit Mascarponefüllung, Kartoffelchartreuse mit Steinpilzen und Trüffleschaum, Panna Cotta von weissem Trüffle aus dem Piemont, which consisted of Homemade ravioli filled with mascarpone cheese, a ring of standing Penne Rigate filled with puree of potatoes and wild mushrooms and embellished with a truffle cream foam, and Panna Cotta with Piedmont truffles. Between courses, Chef Felix sent us a Greeting from the Chef, large succulent prawns with crispy breadcrumbs with three types of mustard, which we quickly devoured savoring each bite. For my second course, I had Tapas von weissem Trüffel and compared notes with Oliver on this interesting presentation of tastes and texture. 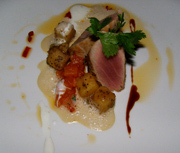 For his third course, Edward had Rosé gebratener, marinierter, roter Thunfisch auf westbengalischen Mohnkartoffeln, Papaya-Cuurrysauce mit Joghurt, which was Rosé marinated and fried red tuna with large diced potatoes with poppy seeds, and a foamy papaya curry sauce with yogurt. Oliver continued with the Zanderfilet mit knusprigen Speckchips auf kleiner "bortch russe" mit Sauerrahm und Kaviar, which was Perch topped caviar, with crunchy bacon chips scattered on the plate, a colorful presentation of diced carrots and zucchini, and a small bowl of Russian borscht with sour cream and caviar. Edward continued with the Maispoulardenbrust mit Kebabfüllung auf Kürbisgemüse mit Cashew-Nüssen würzige Ananas-Kürbissauce (Corn-fed chicken breast with balls of pumpkin, baby carrots, pineapple, and toasted chopped cashews, with a pineapple pumpkin sauce). For his fourth course, Oliver selected the Angus Rinsdfilet aus Ennetbürgen mit kleinen "Szegediner" Gulasch Rheintaler Ribelmaisschnittchen, which was Angus beef with pool of sauce, goulash and baby carrots accompanied with a bowl of mixed vegetables. Although the large selection of cheese on the cheese trolley looked wonderful, we decided to pass this course, in order to savor the desserts. Chef Felix sent us a pre-dessert of raspberry with Sichuan pepper sorbet served in a shot glass and garnished with a Florentine-like spear, and a crème brûlée made with Maracaibo chocolate from Venezuela served in a small square white bowl, beautifully presented on a special art glass plate. The Sichuan pepper added a lively flavor interest to the raspberry sorbet, and paired with the chocolate crème brûlée, it was pure magic. Dessert was a beautifully presented small Quince Apple Cream Tart, with a quenelle of yogurt cinnamon sorbet garnished with a mint leaf, a chocolate frappe with Granny Smith Cream, a triangle of Florentine cookie and a thin swirling ribbon of chocolate on a square glass art plate painted with chocolate. Decadence continued with a selection of twenty-one pralines, pastries, and homemade chocolates presented on rectangular black slate, which of course, we had to sample, since they included my new autumnal favorite, chestnut puree tarts with dollops of whipped cream and accented with pieces of chocolate. Afterwards we took a stroll on the roof terrace to enjoy the exciting view of Zurich, before taking the funicular down to the city. It was indeed a gastronomic night at Spice. Read Chefs' Recipes where Chef Felix Eppisser shares a few of his creative recipes.